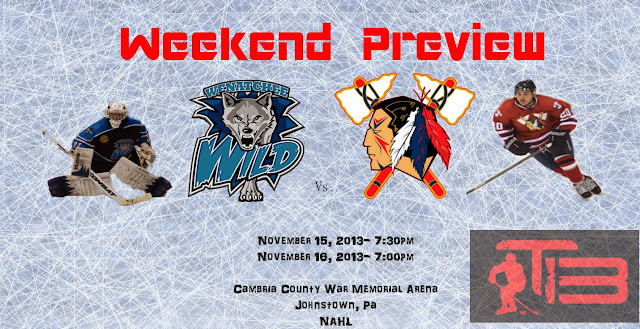 Johnstown enters another weekend at home riding a three game winning streak. This will be the second to last weekend the Tomahawks are at home. Next weekend they'll play Port Huron (once again) and then take to the road for a month, not playing at the War Memorial again until New Years Eve. Johnstown enters the weekend with an overall record of 11-8-1, good for 23 points, and third place position. Wenatchee comes to Johnstown with an overall record of 8-9-2, good for 18 points, and last place in their division. Wenatchee has been a good team at home this season, but on the road they are 1-6-1. 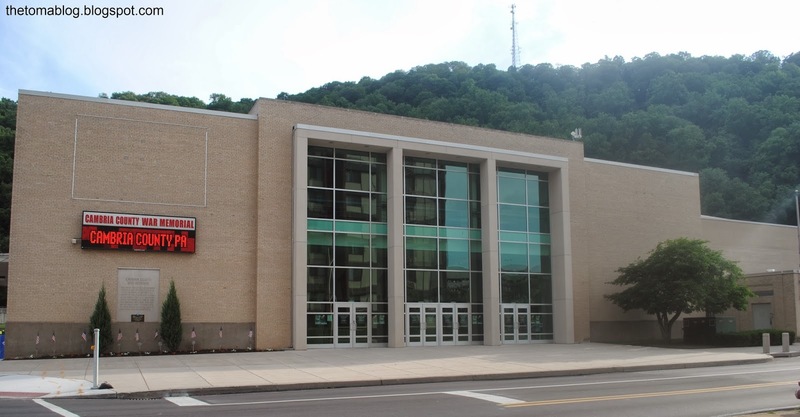 This is a big weekend for Johnstown as they can possibly extend their winning streak to five games, and pick up a big four points in the standings. Also worth noting, the next ten games the Tomahawks play are vs. Wenatchee and Port Huron. Six of those games will be vs. the Wild. The Wenatchee Wild has always been a premier organization in the North American Hockey League. The original Wild franchise calls Hidalgo, Texas home and is repackaged as the Rio Grande Valley Killer Bees. The Fresno Monsters were relocated to Wenatchee in the summer and an NAHL team remained in the Washington city. The Wild, led by veteran head coach Bliss Littler, are not the juggernaut they were a season ago. Gone are high-scoring forwards Jono Davis, Chris Kerr and Max McHugh. The scored a combined total of 77 goals for Wenatchee. Gone too are defensive stalwarts Dylan Abood, Joshua Hartley and David Mead. Hartley’s absence is huge for the Wild as he provided points and stability from the blue line. I think of him as Wenatchee’s Casey Nelson. With a whole new team, the Wild have struggled and sit in the basement of the Midwest Division with an 8-9-2 (18 points). Do not let their record fool you, this Wild team can be just as dynamic and dangerous as their predecessors. Although, they are smaller than Johnstown, they can still present problems such as speed and skill. A player to for Tomahawks fans to watch is Parker Tuomie. The Biemerhaven, Germany native, Tuomie is a player that generates plenty of offense. He utilizes his strong puck possession skills and can create chances from anywhere on the ice. He shoots the puck a lot, possesses tremendous work ethic and is responsible defensively. I expect his name to show up on the score sheet. River Rymsha is another player fans should watch. He is a defenseman from Huntington Woods, Mich.
Rymsha is committed to Division 1 Dartmouth College and was Take in the Future’s Draft by the United States Hockey League’s Fargo Force. He is smart with the puck and active with it as well and could find his way into the USHL soon. Rymsha previously played for the Little Caesar’s Midget Major team in 2012-13. His teammates that year were current Tomahawks Shane Bednard, Alex Jaeckle and Brett Young. Wenatchee is talented, fast and could present problems for the Tomahawks, if Johnstown gives them any space. · Simplicity with the puck works more often than not. Get pucks high and hard off the glass. Dump and chase and battle for loose pucks. Fancy moves and plays should be kept to a minimum. It hinders mistakes and turnovers, which can cost a team. · This is probably going to be a common theme for the Tomahawks. No team likes playing from behind so scoring the first goal is very important. With a skilled team like Wenatchee, scoring the first goal is paramount. · The Tomahawks should get traffic in front of the Wild goalie. Creating havoc with bodies in the crease could result in a goal. This strategy should also be implemented on the power play, which is something the Tomahawks are ranked 17th in the league in. 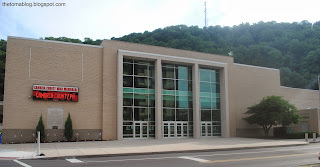 · Keeping the pressure in Johnstown’s offensive zone is crucial to get their players scrambling. When under pressure, players tend to make mistakes with the puck and knowing the whacky bounces that occur at the War Memorial, mistakes around bound to end up in the back of the net. · There is no doubt the line of Mullan-Bednard-Recktenwald is clicking on all cylinders right now. They have been a force on the ice for the past two weeks, especially Bednard. If Wenatchee can find a way to contain this line, it could force Jason Spence to shuffle lines. · This was the problem Springfield had against the Tomahawks. Johnstown did a great job of clearing the puck and not giving anything easy to the Jr. Blues power play players. Wenatchee needs to put the puck in the net with the man advantage. As stated, this edition of the Wenatchee Wild is not quite has menacing has their predecessors, but can still be a dangerous team. Do not let their last place standing fool you. I know this team is much better than their record indicates. Last season, Wenatchee and Johnstown endured a physical, emotional series and I expect more of the same. These two teams can develop a nice rivalry despite being separated by 2,400 miles. I expected an excellent two games at the War Memorial. Currently the Johnstown Tomahawks have two players on Youngstown's roster. Colin DeAugustine and Joe Drabin. Playing for the Esmark Stars in the NAPHL is defenseman Tristan Ramage. We do our Alumni stats updates every week, which you can find here. We figured we should do some type of stat update for players that still have Tomahawks' connections. Here's each players stats away from Johnstown.